There are two pieces of music that particularly stir the hearts and emotions of Americans — The Star-Spangled Banner and Taps. I sounded the call at the funeral of General Ira Eaker, commander of the 8th Air Force during World War II, and for the funeral of General Godfrey McHugh, Air Force Aide to President Kennedy. I sounded the British call “Last Post” at the grave of a WWII Australian flyer who is buried at Arlington National Cemetery, in a ceremony attended by the Australian Air Force Chief of Staff. On most Memorial Day weekends for over a dozen years I have performed at a memorial service for the Flying Tigers, the WWII flying group, at the Old Memorial Amphitheater at Arlington. This is especially moving for me, to see these real heroes of a previous generation. Indeed it is my honor when I get a chance to perform this ritual for those who have given part of their lives to our nation. And there is certainly a need for qualified buglers around the country to perform this service. In the past, when not available, military buglers could be replaced by musicians from a VFW or American Legion Drum and Bugle Corps or even Boy Scouts. However, the tradition of bugling and drum corps in those organizations has all but disappeared. A real shame, for those groups have long fostered musicianship and patriotism. With veterans dying at the rate of over one thousand each day and with many of the funeral services only having a recording of Taps as the musical honors, lawmakers are looking into having legislation passed to ensure that each family that requests military honors for a deceased veteran will be provided with a live bugler and firing party. However, I surmise that there is not actually a shortage of buglers but simply an inadequate system currently in place to make sure all requests for a live bugler are met. If you are interested providing the service of sounding Taps at a funeral, you may want to alert your local VFW and American Legion Posts and local funeral homes that you are willing to perform at funerals, or contact your state’s National Guard office and find out if they have a need for civilian contract buglers for ceremonies. Many buglers and professional trumpeters are willing to sound Taps and can be hired to do this duty. Because few civilian buglers today have the background of a military musician and many are unaware of the protocol involved, the following guidelines are written to provide those with little knowledge of military ceremonies with the basics needed for rendering this honor. These guidelines can also be downloaded as a PDF FILE HERE. I hope this helps to guide those buglers who have a sincere interest in sounding Taps at funerals. I have heard this on many recordings, in movies, at live performances, and for the first part of my performing career that was how I played it. The correct way should be the straight eighth note, not the dotted eighth and sixteenth note rhythm. As a trumpet player schooled by teachers well versed in orchestral and solo literature, I was taught that certain solo pieces and orchestral trumpet excerpts are to be performed in a definite fashion. I feel the same about Taps. Think perhaps of changing the rhythm of Beethoven’s offstage “Leonore” call, or maybe the solo in the Lieutenant Kije suite of Prokofieff, because you want to subject it to your own “interpretation.” It just isn’t done, and Taps should be treated the same way. The sounding of Taps can be open to interpretation in deciding how long to hold the fermata over the third, sixth, fifteenth, and twenty-fourth notes. However, there should be no question of the rhythm as mentioned above. When you examine the printed music, you will see that most bugle manuals contain the straight eighth note rhythm. A. The most important basis for my thesis is the many bugle, drill and tactical manuals that print the call. In most manuals, the call is written with the straight eighth notes. The most notable example of the dotted eighth and sixteenth note rhythm is John Philip Sousa’s book, The Trumpet and Drum. Sousa lists the call as “Extinguish Lights” and has a drum part written to accompany the call. The correct rhythm to Taps can be found in virtually every other manual. Sousa probably titled it “Extinguish Lights” because that was (at the time) the official designation. 1. The original 1835 call of Tattoo from which Taps was derived. An examination of the notes that correspond with the present-day Taps shows an even rhythmic figure. 2. The biography of General Butterfield, A Biographical Memorial of General Daniel Butterfield Including Many Addresses and Military Writings, edited by Julia Lorillard Butterfield (his wife), shows the call printed on p. 49 with the straight eighth note figure. 3. Oliver Willcox Norton published a pamphlet in 1903 entitled Two Bugle Calls, in which he reminisces about his Civil War days and discusses calls written by General Butterfield. The call is printed on the last page. 4. The 1874 revised Upton’s Infantry Tactics shows the first version of the present-day Taps in a U.S. Army book. These are extremely reliable sources in that Butterfield is credited with the call and Norton was the first to play it. C. It is the way it is sounded by all armed services at Arlington National Cemetery for funerals, wreath-laying ceremonies, and memorial services and at The Tomb of the Unknowns. Why then, is it so frequently performed wrong? I believe that the call has often been passed around by rote, with few buglers checking the manuals. Also, it has been performed in that manner in many Hollywood movies. Why care? As musicians and performers, trumpeters should strive to play with the utmost perfection. 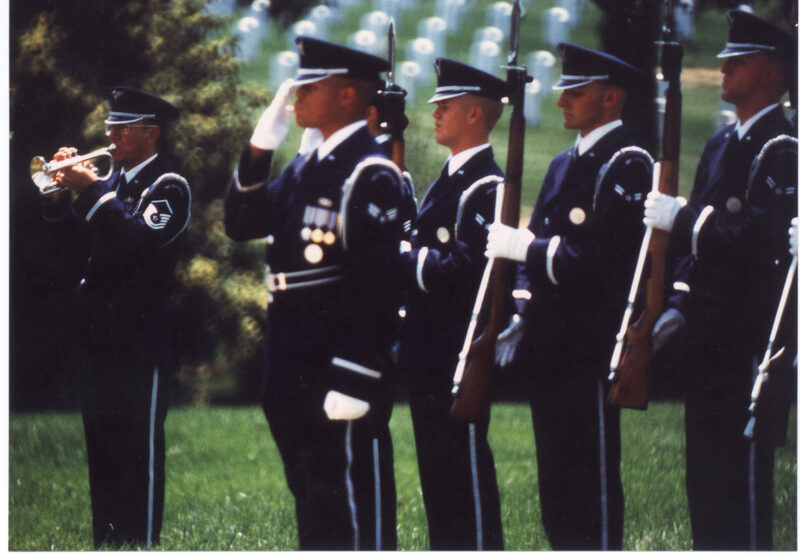 Is it appropriate that a civilian playing Taps give a salute and order arms as outlined in the guides at this site? I was always under the impression that no civilian be saluting or ordering anything. A bugler should be seen. I have never seen a military manual that states a bugler should be hidden. I was taught a bugler should not be seen during taps at a funeral. Is this true? I always stood out of sight…behind a tree, a berm, etc. It would be very appropriate. fallen veterans of our county? We want to be honorable in all ways and do not want to inadvertently cause distress over misguided attempts to honor. Thank you for any information you provide. I now play electric bugle. 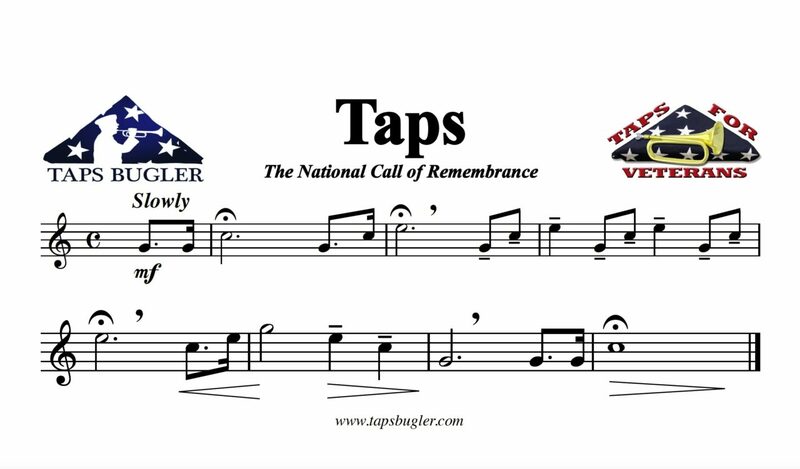 Is it appropriate to play TAPS at a Veteran’s day ceremony to honor our fallen soldiers?